Buy 1 for $9.56Buy 2 / Save $0.51!Buy 3 / Save $1.91! The buchu bush originated in South Africa and was first introduced into Europe at the end of the 18th century The name comes from an African word meaning "dusting powder" and the plant was traditionally used externally as an insect repellent. By the 1920s, it was established in the British pharmacopoeia as a herb that can be used for urinary gravel and cystitis, much as it is used today. However, in parts of the Cape it was recommended as an internal supportive for digestive problems and rheumatic disorders. The name is applied to a number of closely related South African shrubs. "Oval", "long" and "round" forms of buchu are known, with the names descriptive of leaf shapes, although all have identical health uses. The herb contains a volatile oil with a smell reminiscent of blackcurrants, which helps to make it one of the more palatable herbs in the herbal repertoire - as such, it is sometimes included as a flavoring. 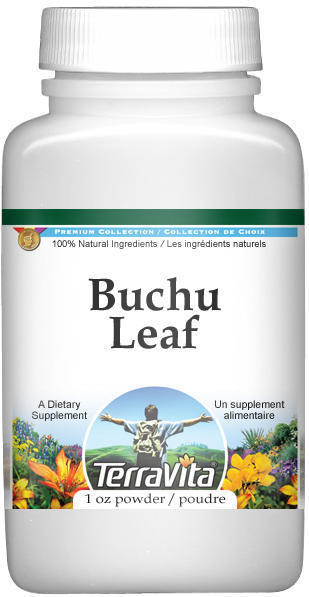 Buchu has a stimulant effect, is a tonic and warms the kidneys. Its taste makes it particularly palatable in teas for home use - mix 25 g of the leaves with 500 ml of water and take in wine glass doses to ease cystitis and similar problems.